Handicapped Float Tubers? - What's this all about? Join in on the fun! Meet with us at our Yahoo Group. With all of the Float Tubers out there, wouldn't it be nice if someone made a Fish Finder with us in mind? I know what you're thinking... "they already do". Sure they do, if you don't mind parting with $200.00 and then have something else dangling in the water. Hey, between my big flippers and a trolling motor - I give the fish a genuine obstacle course. If you've ever had a fish wrap a line around your flippers - you know that you don't need something else hanging in the water! AND... wouldn't it be nice, if you decided to do a bit of shore fishing, that you could use that same Fish Finder? hmmm? Is this too much to ask for? NOPE! 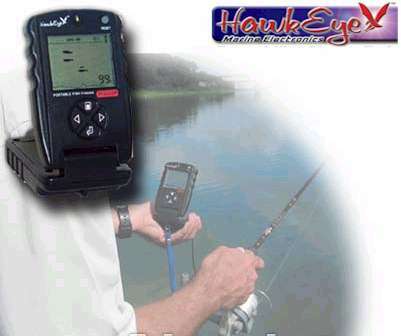 The "HawkEye Portable Fish Finder" does all of this. You can use it in a Float Tube, a boat, from the shore, heck you can even use it from a bridge. It's small enough to store in your tackle box. You don't need to buy a special holder - it comes with a neck strap. At half the price of other Float Tube Fish Finders, this is a real DEAL! 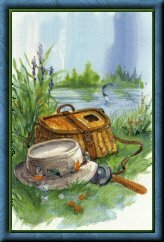 Why kick all day - hoping to find a good fishing hole? Fish smart! Quit guessing and start catching! Order yours today! Allan Cole isn't just knocking on wood when he talks about the fishing plug he invented. Don't put that float tube away for the winter - get ready for "Cold Weather Tubing"
HFTA has had several offers for a TV spots. Steve will be in charge of the still and video photography for the association. He's already informed me that we need to hit the water. I reminded him that it's winter, here in the mountains of California, but that didn't change his mind. He's just ordered a CADDIS Navigator II and as soon as it arrives - we're heading to a Lake, in search of 20-40# Stripped Bass. I want to welcome our newest members from New Zealand, Spain & Great Britain. Glad to have you aboard! Don't forget to send me pictures of your catch! 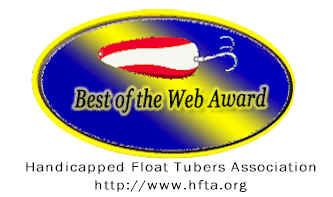 Whether you have a physical challenge or not, join the Handicapped Float Tubers Association. 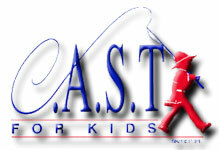 It's one way to show your support for the disabled angler! What to do when you CATCH yourself! This device ties knots that hold. Quality knots save lures, fish and time. 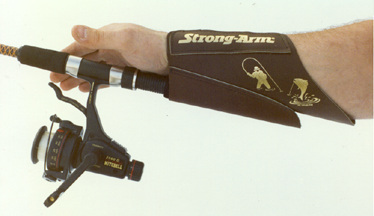 Useful for anyone and a must for one-handed fishing. Aids fishermen in threading hooks, tying knots, and cutting line. The Ty-All comes with mounting bolt and wing nut, line cutter and threader, and instruction book which illustrates knot tying. HFTA is still looking for Sponsors. We have a tournament coming up and could use product. Here's a great new product! 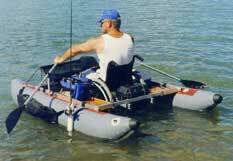 This is the "Wheelmaster", made by Dabbie Float Tubes. More and more anglers today are switching to J-Plugs® because, as in the past, plugs are known to produce more and larger fish on a regular basis. Send your articles and pictures to me and I'll post them here for the rest of us to enjoy. Is all Dough Bait the same? Are fish really attracted to it? Which gets the most strikes? How long will it stay on the hook? What's the best way to fish with it? We're doing some field testing with these popular baits and hope to answer these questions and many more. 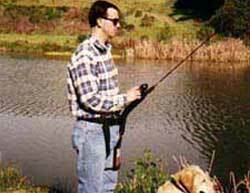 Learn how-to make your own Texas Rigs, Carolina Rigs and Flipp'n Rigs. 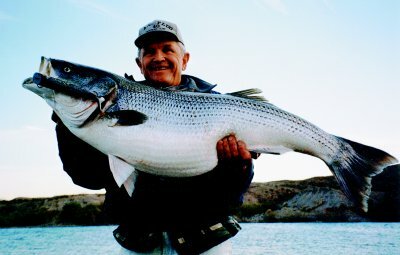 Then go get some nice big Bass! We have a bunch of recipes for Trout on the Recipe page. Check it out! of you and your catch! 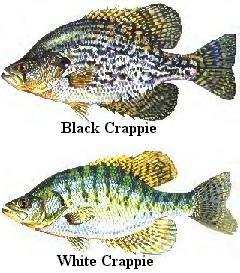 Looking for a Fishing Guide? If you're like me... you've watched just about every late night info-mercial. I saw this one and had to try them... Banjo Minnows! 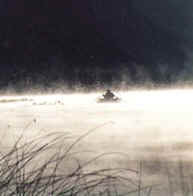 Fly Rod & Reel, with travel features, qualitative equipment reviews, advice on tackle and technique, personal essays and more, is written, edited and designed with the enthusiastic angler in mind. Theresa was thrilled to have won the CADDIS Float Tube, in our 911 Fire Fighters Disaster Fund Raffle. We managed to raise a couple hundred dollars and pray that it will help the families of these heroic men and women. A very special thank you to CADDIS Float Tubes - for helping us! Recently, our website has proudly, received some awards. You can see them on our Awards Page. We appreciate each and every one. Since I've visited so many great websites, I thought it only appropriate to highlight some of these sites, by offering our own award. So, if you have a website - drop me a line. 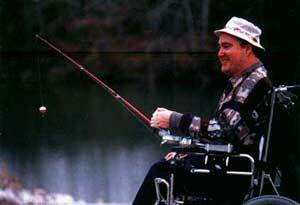 It doesn't have to be a Fishing Site, as long as you support the handicapped anglers. Click & Join - it's that simple! That includes enjoying Sport Fishing. HFTA wants to help you find a way to do just that. So, join us and let's go fishing! You don't have to be disabled to join the HFTA Team. This Fish and Fly European Flyfishing Webring site owned by Fish and Fly.